There’s a certain reddish hair-color known as Titian and when I look at this painting and the color of the sitter’s hair, it dawned on me, is the name of the hair color named after the artist Titian? This portrait’s sitter is said to be Lavinia, the artist Titian’s daughter. Lavinia was born in 1530 after a difficult birth which caused the death of Cecilia, Titian’s wife and mother of their two sons Pomponio and Orazio. 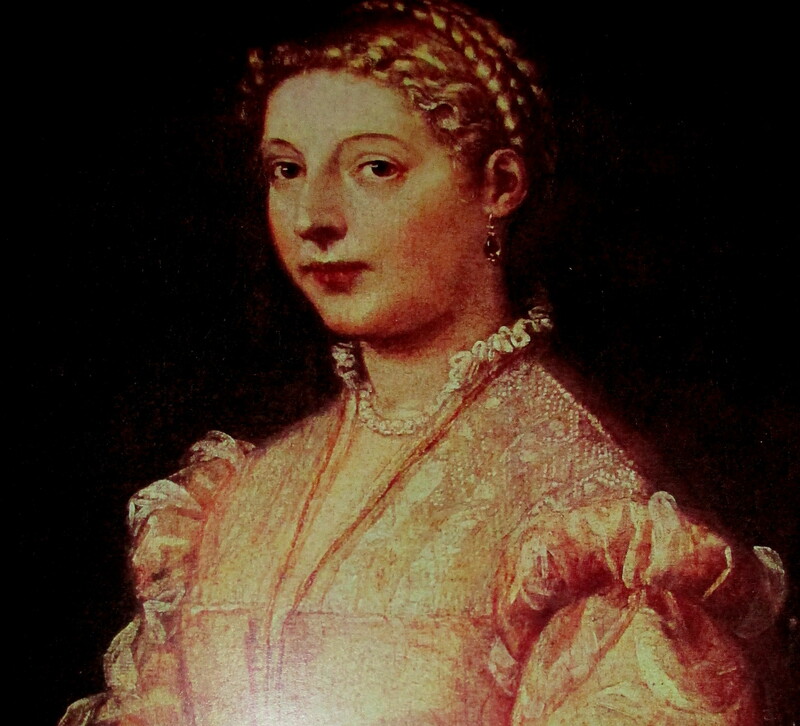 Strangely, Lavinia, who married Cornelio Sarcinelli of Serravalle in 1554, also died in childbirth in 1560. But what of Titian, the Venetian himself? It seems that he died 437 years ago on 27 August, 1576 as a result of a plague which raged through Venice that year killing both he and his son Orazio. Titian, aka Tiziano Vecelli, Tiziano Vecellio and da Cadore, (after his birthplace of Pieve di Cadore, in the Republic of Venice) was born ca 1490. After his death, he was interred in the “Frari” – the Basilica di Santa Maria Gloriosa dei Frari. A prolific and admired artist, his many works are shared amongst many of the greatest galleries and collections around the world. This portrait is part of the Musee Gallerie Nazionale de Capodimante collection in Naples, Italy. This entry was posted in OilPainting, Paintings and tagged Art, Lavinia, Titian, Venetian art. Bookmark the permalink. I do believe you have it right: the hair color is named for the artist who depicted it so well.